(1) Hard Drives: Inside these little boxes is where the thousands upon thousands of photos are stored. There are actually two identical drives. (You can see the second one just underneath the first in this photo.) Every time that you post a photo to this site, it is saved to both drives. That way, if one of the drives should fail, the site will not go down, and the drive can be replaced without having to restore any photos from backup. (2) The CPU (Central Processing Unit): This is the server's "brain". When you look at a photo in the Photo Archive, this is what does all the work - figuring out which photo you want, finding it on the hard drives, retrieving it, and sending it over the Internet to your computer. (3) RAM (Random Access Memory): RAM is used for a number of things in a server, one of which is temporary high speed storage ("caching"), which makes the site a LOT faster than it would be otherwise. When you view a photo, it is loaded from the hard drives to the RAM and kept there for some time, that way if someone else views the same photo, the server doesn't need to retrieve if from the hard drives again, which would take more time. (4) Power supply: This takes the 120 volts of power from a standard wall outlet and converts it in to the various lower voltages that the server actually runs on. (5) RAID Controller: RAID stands for "redundant array of independent disks", and the RAID controller is the special device that makes the dual hard drive setup described above work. (6) Floppy and CD-ROM drives: These are just like the ones in your home or office computer, and are used when doing upgrades of the software on the server. (7) Fans, fans, fans: Unlike in a home computer which may only have one or two fans, servers have many. They need more because they are usually running at higher speeds than a home computer, and thus generate more heat. 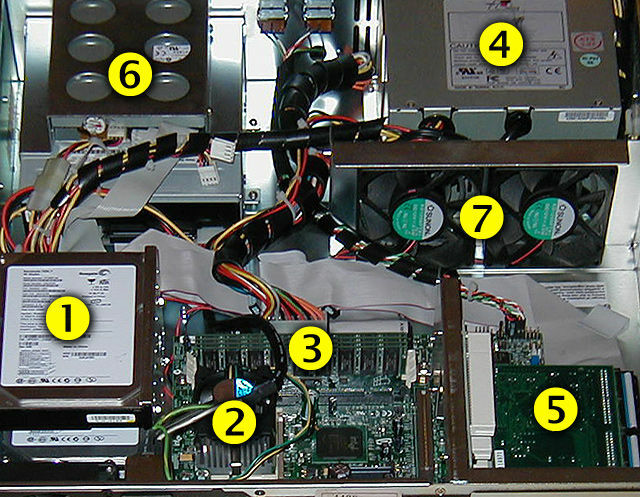 Keeping the temperature down also makes the server more reliable, since heat is one of the main causes of computer component failures. The Photo Archive's server has 6 fans in it, including these two extra large ones that move air through the power supply and out of the system.